Dubai is full of hotels for every occasion, from flashy five star resorts to budget-friendly options and everything in between. But that doesn’t mean we won’t be getting plenty more. This year has already seen brand new resorts open, from beachfront spots on the palm to budget Business Bay abodes. So if you’re browsing for a new staycay location, we’ve rounded up ten hotels that have opened their doors this year, and a few more still to open. The Address Downtown re-opened its doors in June after it suffered substantial damage during a fire on New Year’s Eve 2015. The 63-storey property features 220 guest rooms and suites, a new spa, several brand new restaurants as well as updates to some of the best-loved brands that were previously in the hotel. Address signature restaurant The Restaurant, a lobby lounge, Japanese Katana and American steakhouse STK are all already open, with 63rd floor bar Neos, a Turkish restaurant The Galliard and Californian fusion restaurant Zeta all opening soon. 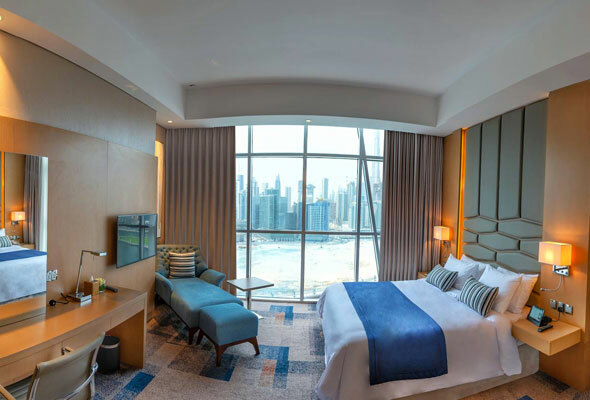 A five star resort overlooking the Creek, the Al Bandar Rotana opened its doors in February 2018. Offering 190 guest rooms starting from a great-value Dhs290 per night, rooms are spacious and furnished with modern, contemporary furnishings. There’s five room categories from classic rooms to the royal suite, but we’d always opt for a room with creek views. 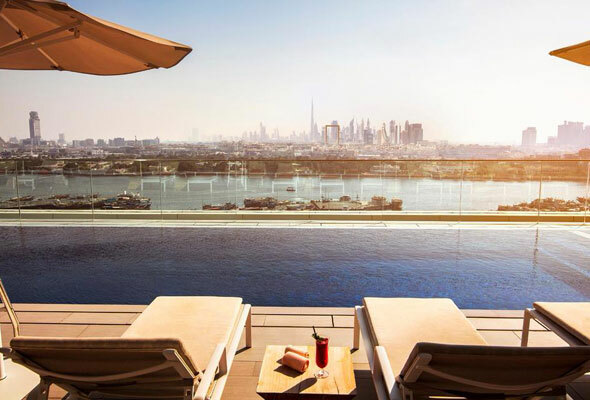 Elsewhere in the hotel, you’ll find a rooftop pool with views out to the twinkly Dubai skyline with adjacent bar, coffee shop in the lobby, all-day dining restaurant, and a gastropub called Morgan’s. The jewel in the crown here though is a small Italian restaurant, Gusto. It boasts a fortnightly changing menu of authentic Italian dishes cooked from an open kitchen as well as stunning views across the Creek from it’s enviable 18th floor terrace. 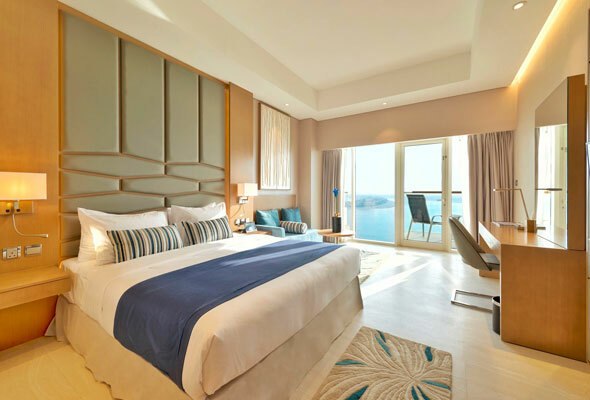 The 206-room Aloft Palm Jumeirah was one of the first new hotels to open its doors in 2018. Welcoming guests from January, it’s one of several more wallet-friendly options that have opened on The Palm. Rooms are kitted out in fresh yellow and turquoise hues, with some sea views boasting neat little balconies that look out towards Jumeirah. As well as beach access, the hotel has an outdoor pool with adjacent pool bar, a 24-hour gym, grab-and-go restaurant, bar, all-day dining restaurant and Mexican cantina, Luchador. Rates start from Dhs325 per night or Dhs425 including breakfast, or over summer they’re offering a great value brunch and staycay package priced at Dhs799 for two inclusive of Friday brunch at Luchador, an overnight stay, breakfast and pool access the following day. 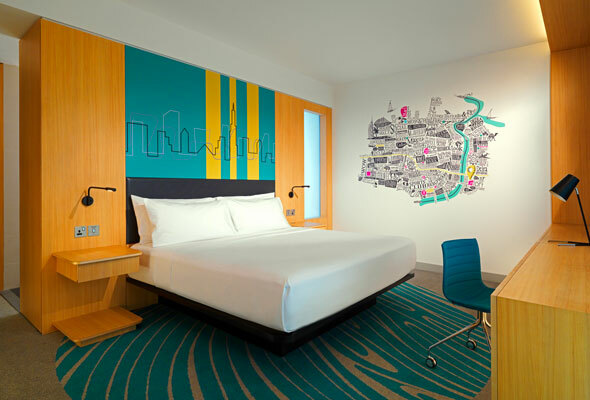 One of three recent Aloft hotel openings in Dubai, Aloft City Centre Deira recently opened its doors in Dubai’s Old Town. The movie-themed hotel is connected to the City Centre Deira mall, and boasts direct access to a host of shops. Back inside the hotel, you’ll find a licensed VOX outdoor cinema, where you’ll be able to catch movies al fresco when the weather cools down. There’s 304 rooms inside, with rates starting from a reasonable Dhs287 per night. Restaurant-wise, you’ll find an all-day dining canteen, grab-and-go counter, signature W xyz bar and a soon-to-open kitsch looking Chinese restaurant, Han Shi Fu. There’s also a gym and pool for those looking to keep active during their stay. Bay Central is one of two brand new hotels from the Central Hotels group. 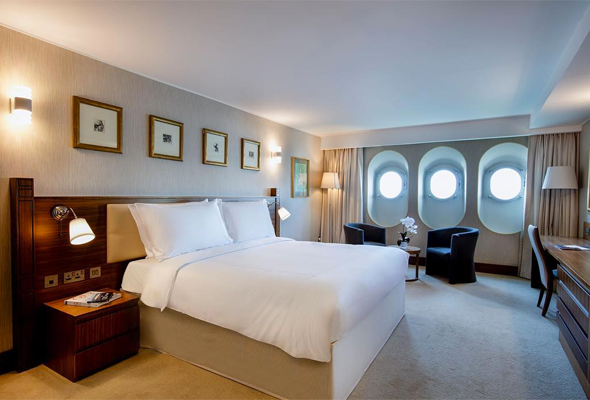 Located on Al Abraj street, each of the 280 hotel rooms comes complete with Dubai Canal or Burj Khalifa views, modern furnishings and high-speed internet. Both king and twin rooms are available, as well as a handful of one-bedroom Bay Suites. 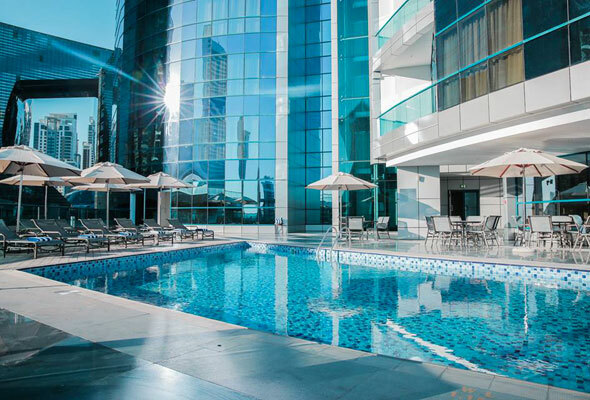 Other facilities in the hotel include a Wellness Valley Spa, fully-equipped gym and our personal highlight, a stunning rooftop infinity pool with picture-perfect Burj Khalifa views. Elsewhere, you’ll find a coffee shop, all-day dining restaurant La Cruise and a two-part restaurant and terrace called Lilly’s. As part of their soft opening period, the hotel is offering a very reasonable opening rate of Dhs349 for a one-night stay including breakfast. Bringing a slice of international history to Dubai, the QE2 finally opened as a floating hotel this year after almost a decade in Dubai. Located in Port Rashid, it’s carefully been restored to look like it did when it was sailing the world in the 1970s, rather than being modernised. There are 224 guest rooms, an interactive museum, and there’s even been a restoration of the casino with its original slot machines now decommissioned. A spa and pool deck is set to open later in the year. You’ll also find a theatre, cinema and 13 dining and nightlife options – including some of the ship’s original restaurants. Our highlight is The Queen’s Grill, which serves up a menu that the Queen of England would enjoy when she dined onboard. 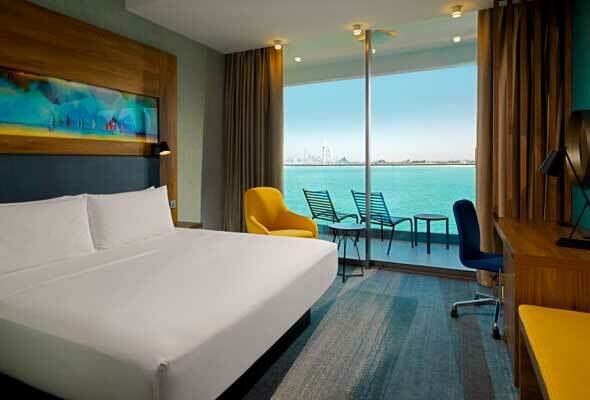 The Radisson Blu Dubai Waterfront is another newcomer in the Business Bay area. It has 432 rooms and suites, which are pretty spacious and furnished in a contemporary way. Many of the rooms also come with private balconies, something that’s increasingly rare with hotel openings in Dubai. 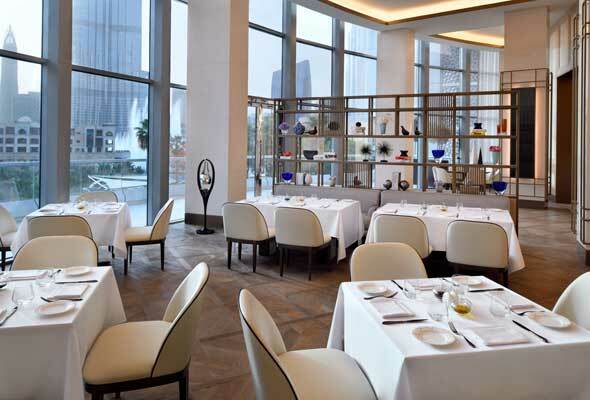 It’s got some great Burj Khalifa views from the Downtown facing bedrooms, and third floor restaurant Fire Lake Grill looks right out onto Dubai Canal from the expansive terrace. There’s a large pool with a scattering of loungers, a 24-hour gym and a Dreamworks spa. It’s also home to Home to super club Gotha club, Lebanon export Republic, and a Scottish-themed lounge bar, Makar. There’s a big focus on service in this hotel, and you’ll find nothing is too much trouble from the smiling staff. 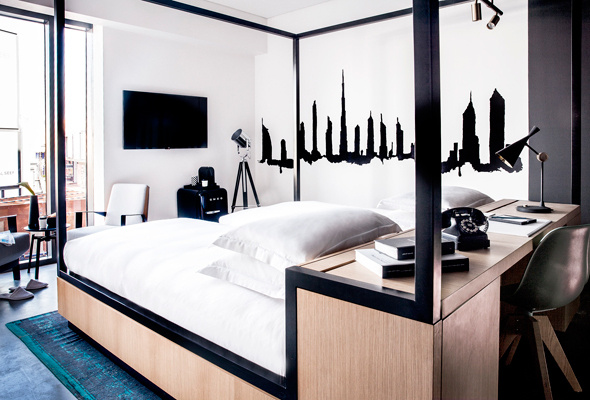 The fifth serving of budget-friendly Rove Hotels has opened this year in Dubai Marina. The 384-key Rove Dubai Marina is located on Marina Promenade at the southern end of Dubai Marina, near The Beach at JBR. It’s within walking distance of the Jumeirah Beach Residence 2 tram station, which feeds into the JLT metro station. The hotel has an outdoor pool, sundeck, 24-hour gym, convenience store, self-service laundromat and all-day restaurant, The Daily. Rooms feature 48-inch smart TVs, high-speed wi-fi and power rain showers in modern bathrooms. Amenities are simple, but rooms are a steal at Dhs225 per night during low season and from Dhs400 in busier periods. Located on the East Crescent of the iconic Palm Jumeirah, the five star Royal Central hotel features private beach access, an infinity pool and 207 guest bedrooms. 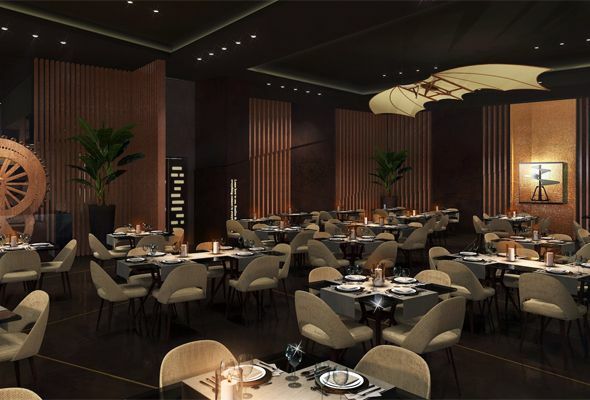 For dining, the hotel features five options including a coffee shop, all day dining restaurant and three signature themed restaurants, two of which are set to open soon. For relaxing, you’ll find a Wellness Valley Spa, or for something a little more up-tempo, there’s a state-of-the-art fitness centre, and water sports from the private beach. Fancy checking it out? Royal Central is offering an opening staycation rate of Dhs499 per room for a standard room for two adults including breakfast. New into the Jumeirah hotels group portfolio is the Zabeel House chain, the first two of which can be found in Creekside destination, Al Seef. Described as the first hotel in Jumeirah’s new “upscale-casual” collection, Zabeel House features design-led spaces with “just enough added extras”. The four-star property is home to 200 rooms, four restaurants and bars, and a rooftop infinity pool with views over Al Seef and Dubai Creek. Zabeel House Mini is found next door. This hotel is described as a place for the traveller who “wants to get out and about but have somewhere welcoming and lively to escape to”. The mini version is home to 150 smaller rooms, a courtyard space designed for pop-up events and outdoor films and two street food-inspired restaurants. Rates start from Dhs350 at Zabeel House Mini, and Dhs495 at Zabeel House. 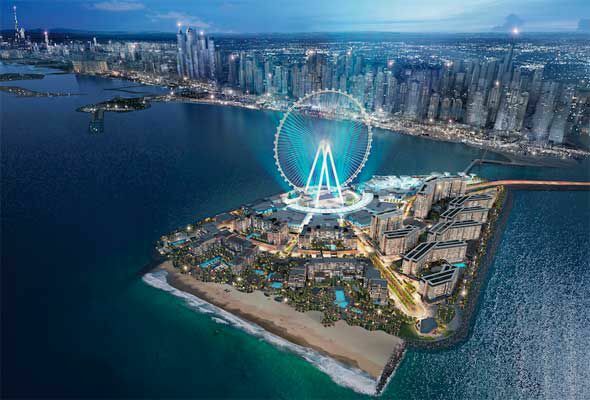 Bluewaters Island off JBR is set to become home to a second serving of famous Las Vegas hotel, Caesars Palace. The collaboration between Caesars Entertainment and Dubai based developer Meraas will see two luxury hotels, a conference centre and brand new beach club all open later this year. Although no details of what this will look like are being released, if it’s anything like the famous Las Vegas version we’re expecting some pretty lavish, roman-inspired decor. 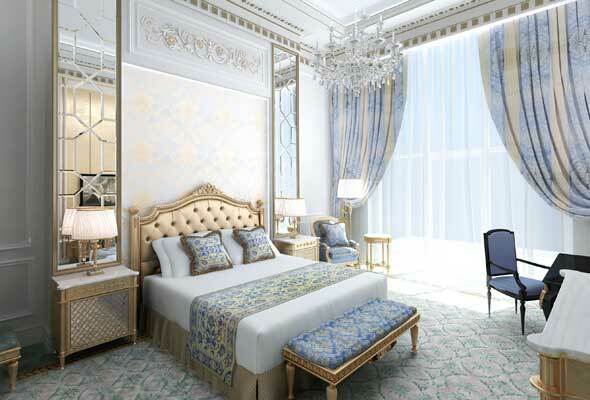 Located on the West Crescent, the 100,000 square metre Emerald Palace Kempinski Dubai will open at some point this year. Inside, you’ll find 389 rooms and suites, eight restaurants and bars, a Cinq Mondes Spa, 500m private white sand beach, 80-seat private cinema and the city’s largest indoor pool. Another addition to the Business Bay hotel scene is the Grand Millennium Business Bay. 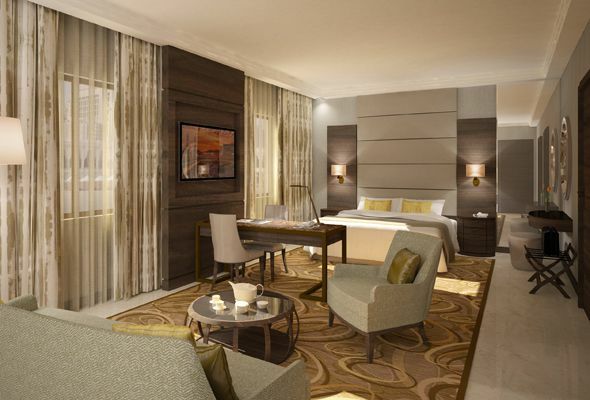 Set to open soon, the hotel will offer breath-taking canal views and five star amenities. Expect 251 rooms and suites as well as seven restaurants including Mexican rooftop restaurant “Toca Madera”. 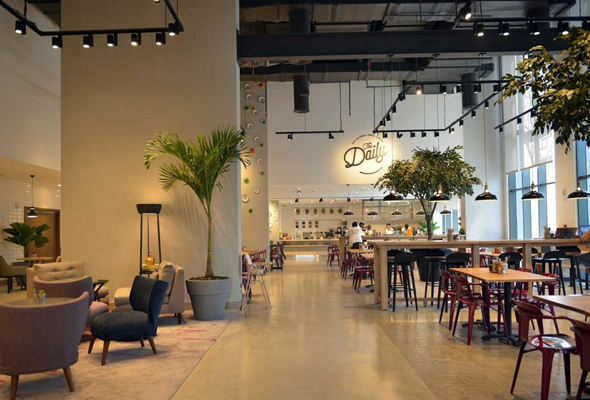 We’re yet to learn of the other restaurants joining the Mexican rooftop spot, but with homegrown concepts Lucky Voice and Lock Stock and Barrel some of our favourites in the city at the Barsha Heights branch, we’ve got high expectations. The first international Stella Di Mare is set to open some time in 2018. The Egyptian hotel chain will open a 369-key, five-star property on the edge of Dubai Marina, spanning 31 floors and coming complete with three restaurants, three bars, a luxury spa, swimming pool, gym and salon. Our eye is on the signature rooftop bar, Skyland, located on level 31. The hotly-anticipated W Dubai The Palm is set to open this September. Guests can bask in Arabian Gulf or Dubai skyline views from the extensive terrace of one of the resort’s 350 guest rooms, including 58 suites. 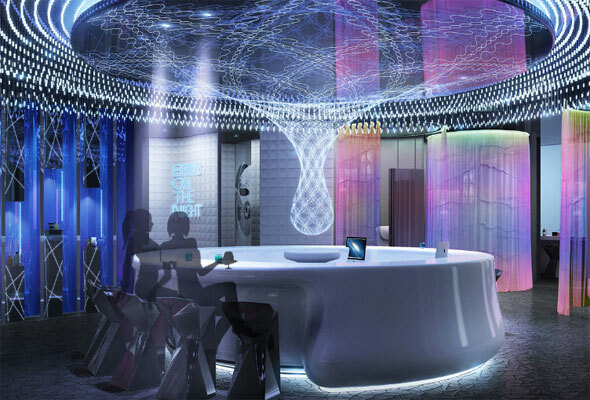 There will be a big leisure and spa focus here, with the region’s first AWAY Spa which combines a lively atmosphere with the ultimate pampering experience, a wet deck that sets the scene for poolside play, and a state-of-the-art gym. Two celebrity chef led restaurants, Akira Back and Torno Subito by chef Massimo Bottura are also set to open within the property.